Before I get into anything, I have to tell you that I can’t move my shoulders this morning and I’m pretty sure that my rear is entirely black and blue from spin. LOL! I am SUFFERING this morning. But I feel GOOD about it. It’s a good hurt, you know? Yesterday, my friend took my son for a playdate and gave me and Bill the afternoon off. That ALONE was a gift… but she also surprised me at drop off. She bought me a water bottle because she found a really good deal while shopping at Walgreens and thought I could use one. I thought that was so sweet! She got one for me, one for her and one for our other friend who we take classes with. These are the same girls who took me out for my birthday. I’m so lucky to have found them so late in my life. 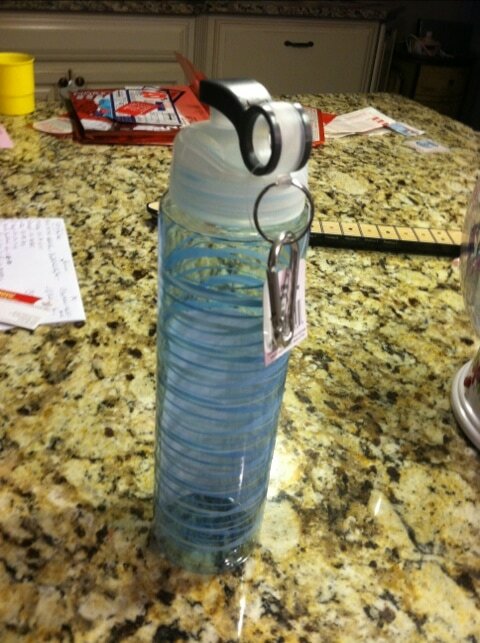 Anyway, I woke up this morning and went to the kitchen to get my tea and saw the water bottle which made me smile. It’s the little things that count, you know? I really really appreciate the thought because I’ve been using my son’s basketball water bottle which is totally busted up. I can’t wait to whip out this puppy next time I go. WHICH WILL NOT BE TODAY BY THE WAY. I’m lucky I’m sitting up right now. This comment is entering me again into the 2nd of 5 $100 CVS/pharmacy Gift Card giveaway 😀 Great deal guys…check out the post!